SAMINA continues to innovate its healthy sleep product line using science-based data. One of the most recent developments is the newly-patented inclined bed called the SAMINA Gravity Inclined Bed. In order to understand our excitement, you have to know the science and research behind a slant bed and sleeping with your head above your feet. Prof. Dr. Karl Hecht, an physiology professor and physician who led 30 years of sleep medicine at the renowned Charité in Berlin and was also a member of the Russian Academy of Medical Sciences, Moscow, the International Academy of Science and Astronautics, consulted with SAMINA and his work in space medicine lead to important conclusions. In collaboration with the team of SAMINA and founder Prof. Dr. Günther W. Amann-Jennson, they extensively reviewed the scientific findings of NASA scientist, Dr. Joan Vernikos; the researchs and experiments of Andrew K. Fletcher (UK / Inclined Bed Therapy); the written dissertations of Ross Singer (USA / book “Get it up”); amongst others. SAMINA continues to innovate healthy sleep products using science-based data and one of the most recent developments is the newly patented inclined bed called the SAMINA Gravity Inclined Bed. But in order to understand our excitement, you have to know the science and research behind sleeping inclined. SAMINA founder Dr. Günther W. Amann-Jennson wrote an article based on his research and experience entitled, “Gravity Inclined Bed – Innovation for Enhanced Detoxification and Regeneration During Sleep”. Jennson outlines in great detail “the importance of gravity with respect to our health and wellness and its relationship to sleep, detoxification, and regeneration. A healthy night’s sleep can do wonders for any person. 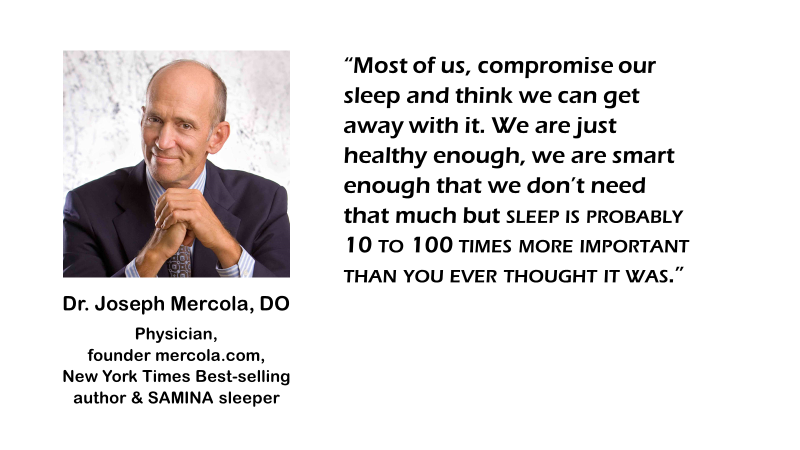 It helps reduce stress, anxiety, depression, on top of giving your organs and body the time to regenerate.” Sleep scientist Professor Dr. William C. Dement, MD proclaimed that 90% of our health depends on our sleep. But naturally how one sleeps is just as important as sleep itself. Dr. Amann-Jennson poses the question of the possible side-effects that may come from a straight horizontal sleeping position. He gives examples of animals from baboons to cattle, from birds to penguins that don’t sleep horizontally and questions how gravity affects us when we sleep in a horizontal position night after night. Questions science cannot clearly answer now. Intracranial pressure is increased when sleeping horizontally. Dr. Amann-Jennson states, “When the brain receives more pressure due to our resting position, there are various pressure receptors especially in the neck area, which contribute to lowering blood pressure and thus help prevent excessive intracranial pressure.” This means that our blood pressure is lower when we’re asleep and when we’re laying horizontally. He states that being in a vertical position for long periods has also been an issue, and for those who work on their feet all day, can feel the effects on their swollen feet and ankles by the end of a shift. Apart from just the brain while you’re sleeping horizontally, there’s also a sustained pressure to the eyes, ears, face, sinuses, and to the gums. The increase of intracranial pressure has also resulted in hypoxia and hypoglycemia. While SAMINA offers a patented bed frame solution, Claus Pummer with a background in carpentry also developed an adjustable bed frame solution.